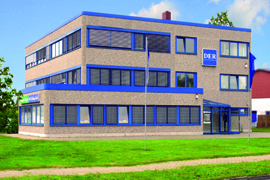 Hensel Elektronik is located in the immediate vicinity of the A19 autobahn. It is also easily accessible by bus and train. This convenient location allows all guests and employees an unproblematic arrival and departure. Parking is available directly at the building. Coming from west: Drive eastbound on the A20. At "Kreuz Rostock" exit onto the A19 (direction "Überseehafen"). At exit "Nord" leave the A19. Turn right at the first traffic light and cross the following two intersections straight. You will find the company building on the right. Coming from east: Drive westbound on the B105. Take the bridge over the A19. Turn right into "Dierkower Allee" at the next intersection. At the next traffic light turn left into "Hinrichsdorfer Straße". Coming from south: Drive northbound on the A19. At exit "Nord" leave the A19. Turn right at the first traffic light and cross the following two intersections straight. You will find the company building on the right. At the central station of Rostock take tram 2 or 3 to station "Dierkower Kreuz". There take bus 18 to station "Martin-Luther-King-Allee". Walk one minute to Hinrichsdorfer Str 7c.